The Storm compels the listener into a world of heightened reality and awareness, revealing an inner purpose to life, its struggles, and its fulfillment. Stearns sculpts soundfields and textures with a palette that seems neither electronic nor acoustic, inviting a musical experience that is profoundly organic and unique; a magnificently crafted musical tapestry. Michael Stearns is a composer and soundtrack designer/producer who lives and works in Santa Fe, New Mexico. His works include seventeen IMAX films, sixteen solo albums and the scores to Ron Fricke’s non-verbal global film masterpieces Chronos , Sacred Site , Baraka and Samsara. His music has been used by NASA, Laserium, and choreographed by the Berkshire Ballet, and was used in part in the Academy Award-winning film Titanic. 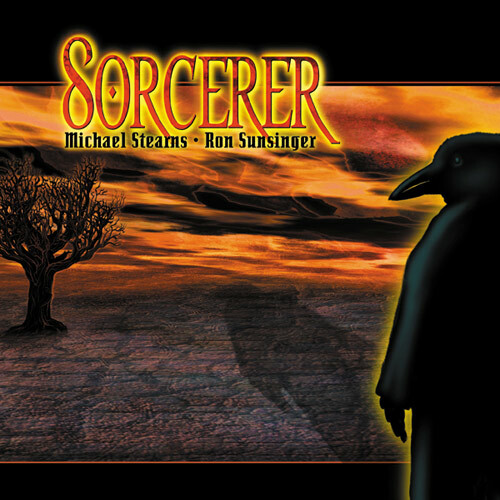 Michael Stearns has recorded a lot of music for soundtracks over the years. He also created a mini-CD for Amplexus. The Storm is a collection from those works, gathered into one package and formatted nicely. These pieces feature some of Stearns' darker and more exotic soundscapes and atmospheres. And, despite being from different media, Stearns has sequenced the tracks to achieve thematic integrity. The opening track, ‘The Storm,’ is from The Doe in the Headlights, a Mountainair Films release directed by Alton Walpole. The track features the quintessential recording of a thunderstorm. That sample has graced many of Stearns' recordings, including at least one of his collaborations with Steve Roach. Roach has used it, with permission, as well. This ambient classic is an absolute essential CD for e-music collectors. From minimalism to ethnic electro tribal soundscapes, this disc has it all. The content of this album by ambient master Michael Stearns is not as new as one might think. In fact, half of the twelve tracks on the album are really new, and contain music Michael composed for various films and documentaries. Nevertheless, it’s always a great joy to hear the impressive sonic paintings he has come up with. The outcome is a nice fusion of immersive environmental sounds and captivating soundscapes, in which the typical Serge sound also shows up. The cd also contains the four tracks which were formerly released on the Amplexus 3’cd-single ‘The Light in the Trees’, but now these tracks have been scattered over this album. Another previously released track is the atmospheric ‘Hantu’, taken from Lektronik’s ‘Soundscape Gallery II’. Especially for collector’s of Michael’s music, the well produced ‘The Storm’ is a must-have. I remember when cracking open a Spotted Peccary release meant an immersion into Native American-influenced relaxation... those days are only scarcely remembered when The Storm blows in... these assorted audio-snapshots from Michael Stearns are culled from various sources and offer various (often quite dark) perspectives on life and its many storms and calms. Thunder, guitar strums and shapeless drifts hover through the opening title track, though not as amorphous as brief The Dream, a billowing tonal swelter which seems to hold unknown power. Far too frightening to be considered New Age, The Gathering churns with ominous intensity (not to mention cawing crows and spooky half-hear choruses amid a rumbling din). More orchestral, but nonetheless apprehensive, Distant Train, Distant Thunder spreads itself in appeallingly dark layers of radiance and gloom; and that thunder seems pretty nearby. Some ethno-fluting and primitive percussive effects gives The Path Between a more-indigenous feeling, though the track is still steeped in a sense of foreboding. Broodingly mystical, lovely Cenote drifts through a soft surreality of gong-born haze. Lighter moods (though still in somber shades) prevail as The Light in the Trees expands into a spacious realm of tone drones. Tastefully applied chants add vocal textures to the swaths of sound which flow through From the Cradle. Sedate symphonics briefly stream on silky strings into Surrender (1:32). Sometimes underscored by the fluid bumping of waterdrums, the wafting glare of Eastern-flavored Bajan (7:09) is soon overpowered by warbly Oriental femme-vocals. This audiometeorological journey is culled from assorted film soundtracks and other CD releases, and delivers an earworthy cross-section of Michael Stearns mood-evoking talents. Put the sonic formations of 8.8 The Storm into your forecast. Michael Stearns spends a lot of his time creating sound design for films, which is often more about texture and mood than melody or rhythm. Much of the music on The Storm is drawn from these film scores. Given their disparate origins, it's striking how well the pieces hold together as an album. The Storm is an excursion into deep, often unrooted ambience. Stearns can completely transform a space with his swirling layers of sounds. Environments cascade atop each other as the Balinese ‘Ketjak’ chant emerges from a white noise of rain and barber-pole glissando, but he also leavens The Storm with welcome respites of minimally drawn melody. ‘The Last Feeling’ is a techno-tribal trance work of plaintive flute melody and hypnotic hand percussion, while ‘The Light in the Trees’ illustrates the deep melancholy Stearns can evoke with just a few well-placed chords. It's a place he should return to more often.